Vikesh Chand Rai graduated from cohort 4 of the TNTA programme and is currently a Third Officer with Maersk Tankers. Vikesh held a Diploma in Maritime Business and learnt about the TNTA programme through the newspapers. He was inspired to join TNTA by his former boss who was previously a ship captain. TNTA has provided him with the opportunity to expand his network while travelling to new places. In addition, there is greater job stability and lesser competition for the same job as he is working for a global community. 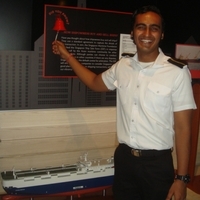 Vikresh aspires to be a Ship Captain one day and eventually, a lecturer to educate the next generation of seafarers in the maritime industry. The communication barrier with other nationalities is definitely a challenge he faces on-board. As time goes by, Vikesh realised that the key to overcome this challenge is to treat all crew as his family and to share problems with one another so as to avoid unnecessary confrontation. He feels it is important to adapt to the different environment and work styles on every ship he sails on. Vikresh highlighted that in the past, shore leaves were for weeks or months. But in today growing maritime industry, vessel turnaround time is crucial and shore leave can be as short as a few days or hours. Additionally, one must be prepared for shift works as there are no fixed working hours onboard a ship. Sailing at sea has taught Vikesh the importance of ownership, taking care of his own well-being and to be accountable for any responsibilities he holds as an officer.